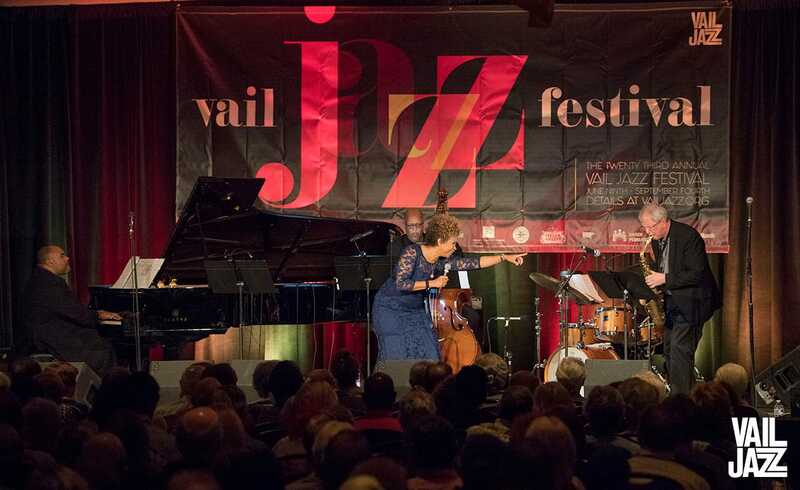 Launching into its 24th year, the Vail Jazz Festival’s summer’s lineup is stacked with young songstresses, established Grammy winners and sky-rocketing new talent. 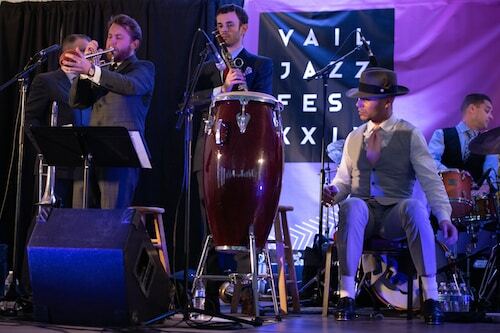 The summer kicks off with an eclectic variety of national and internationally acclaimed artists for Vail Jazz @ Vail Square every Thursday beginning July 5, the Vail Jazz Gala July 9 and five intimate evenings of intimate club performances in July and August. There are more free performances than ever, happening in Edwards every Friday in July and August and every Sunday all summer at the Vail Farmer’s Market as well as at The Remedy in Vail. Of course, the festival culminates with the Vail Jazz Party over Labor Day Weekend – five days of live music featuring the modern jazz world’s top talent with more than 35 headliners. Taking place in the all-weather Jazz Tent in Lionshead, performances kick off at 6 p.m. and feature three tiers of seating/pricing: general admission $25, preferred seat $40 and premium seat $50. Four-pack subscriptions are also available for a 15-percent savings. Drinks are available for purchase. 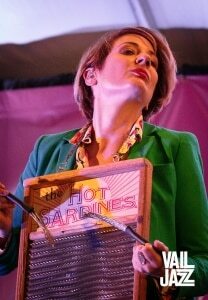 July 5 – Hot Sardines – Touted as one of the most energetic jazz ensembles out of New York City, the lively vocals of Elizabeth Bougerol fuel this eight-piece musical force that will inevitably incite some dancing. 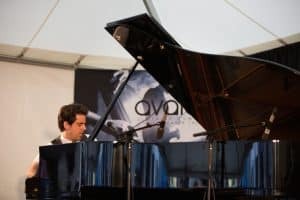 July 12 – Nachito Herrera: A Night in Havana – Performing with the Havana Symphony Orchestra at age 12, the fiery Cuban pianist is joined by his high-energy ensemble for a spell-binding performance with plenty of Afro-Cuban flare. July 19 – Django Festival All-Stars – Following the fast-finger phenomena of Gypsy jazz guitarist Django Reinhardt, this sparkling five-piece swings back into town by popular demand, delivering an extra dose of lightning pace for the big stage. July 26 – Tony DeSare and H2 Big Band – Tony DeSare is famous for infusing a jazz twist on modern pop songs as well as mirroring a young version of Frank Sinatra. Whether belting out zippy originals, putting his own flavor on Songbook favorites or adding a swing beat to a Prince tune, the appeal of this keyboard-playing crooner is only magnified by the melodic thunder of the H2 Big Band Band. Aug. 2 – Andrea Motis featuring Joel Frahm – Barcelona-born vocalist and trumpeter Andrea Motis has made short work etching her place in the international jazz world. At age 23, she has seven albums under her belt and a propensity to swing and bop with the best of them. Along with the renowned saxophone talent of New York mainstay Joel Frahm, this duet, backed by a quintet, is a rare treat. Aug. 9 – Nicki Parrott’s Tribute to Peggy Lee – Having sold out both shows at Ludwig’s during her last visit to Vail, The Australian vocalist and bassist returns to once again pay tribute to Peggy Lee, tapping into a variety set of the late, great singer’s most revered and rarest tunes. Aug. 16 – Veronica Swift – As a testament to her long-standing vocal talent, Veronica Swift was performing at Lincoln Center by age 11. At 23, her skill set has only amplified. Her American Songbook renditions have brought audiences to tears and with the backing of pianist Emmet Cohen and his trio, emotions will surely swell. Aug. 23 – Akiko/Hamilton/Dechter – Among the top touring jazz trios in the nation, organ phenom Akiko Tsuruga, guitar virtuoso Graham Dechter and drummer extraordinaire Jeff Hamilton never fail to impress with high energy, innovative arrangements and world-class musicianship, always leaving rave reviews in their wake. Playing together for years, this ace trio combines the exceptional talents of three singular pros into a greater-than-the-parts amalgam of tasteful, creative, straight-ahead jazz. These performances present rare opportunities for up close and elegant musical evenings with the high caliber Vail Square artists. The events take place on Wednesdays in the intimate setting of Ludwig’s at The Sonnenalp. The evenings comprise of two seatings, the first at 5 p.m. with music beginning at 5:30 p.m. and the second at 7:30 p.m. with music beginning at 8 p.m. Seating is jazz club style at small tables with dinner service available. Tickets are $40 per show or $136 for a four-pack subscription. A $30 food and beverage minimum applies. Bossa Nova Nights Vail Jazz Gala features Carol Bach-y-Rita, fusing her Brazilian-inspired vocals and fervor for Bossa Nova, Samba and Choro with the piano talents of Grammy winner Bill Cunliffe and a slew of Vail Jazz Workshop alumni for eclectic renditions of American Songbook favorites. This one-off performance is an annual fundraiser for Vail Jazz’s vast educational programs, which instill the art and wisdom of jazz to more than 1,400 young learners every year. The event takes place at The Sebastian in Vail and begins at 5:30 pm. Tickets begin at $250 and include a gourmet dinner, cocktails and appetizers. Follow your ears to more free live music every Sunday beginning July 1 at the Vail Farmers Market with a rotating lineup of acclaimed regional acts at Vail Jazz @ The Market from 12 to 3 p.m. in the Solaris tent. Showcasing a variety of regional talent ranging from the Cuban jazz of Los Chicos Malos (July 1) to blues duo Delta Sonics (July 8), R&B-flavored Robert Johnson & The Mark Diamond trio (Aug. 5) or local vocal icon Kathy Morrow’s (Aug. 12) unique takes on jazz classics or the across-the-world upbeat and ever-changing sounds of Fortunato (Aug. 19), the performances are worth hanging out for. Tony Gulizia and Brian Loftus (BLT) are joined by a rotating cast of visiting musicians for Vail Jazz @ The Remedy, which kicks off at 8 p.m. Sunday, July 1 at The Remedy in the Four Seasons Resort, Vail. The performances are free and take place every Sunday evening through Aug. 26. Having established itself as the ultimate way to end a week, Vail Jazz @ Riverwalk will launch the weekend in Edwards every Friday in July and August. The series brings free live music to the Riverwalk Backyard Amphitheater in Edwards beginning July 6 with Colorado’s gospel queen, Hazel Miller. Brazilian rhythm kings Ginga land on July 13, the swinging big band sounds of Joe Smith & The Spicy Pickles July 20 and the pop-inspired vocals of soulful songstress Ayo Awosika July 27. The sizzling, highly varied mix of artists continues in August with brass swingers Red Young & His Hot Horns Aug. 3, Afro funk by Paa Kow Aug. 10, the return of saucy 12-piece Quemando Aug. 17 and the swing-funk sounds of trio Claxton, Kovalcheck and Amend Aug. 24. The 24th Annual Vail Jazz Party serves as the grand finale of the season from Aug. 30 to Sept 3 (Labor Day Weekend). The nearly nonstop indoor and outdoor performances (at Vail Marriott and Vail Square) include more than 35 headliners including, of course, the Vail Jazz Party House Band, return favorites Niki Haris, Jeff Hamilton and Adrian Cunningham as well as Byron Stripling, Benny Green and René Marie, to name just a few, performing in one-off multi-artist jam sessions and multimedia tributes to musical legends. It’s a life-changing long weekend.